Sebastian Vettel and the RB9 walked away from the Autosport Awards as champions. If you’re a race fan, here’s some news that’s about as surprising as waking up to discover that the sky is blue and that you are indeed living on the planet Earth: Sebastian Vettel is the International Racing Driver of the Year. Mr. Do-It-All did it again by grabbing 13 grand prix wins this season on the way to winning his fourth F1 world title in a row. Surprised? We thought you might be. However, Vettel wasn’t the only one representing Red Bull and Infiniti who walked out of the Autosport Awards victorious—okay, maybe he was the only one who walked, per se, given that the RB9 car that Vettel pilots was the winner of Racing Car of the Year. Accepting the award for Racing Car of the Year was Chief Technical Officer, Adrian Newey; Chief Designer, Rob Marshall; Head of Aerodynamics, Peter Prodromou; Head of Car Engineering, Paul Monaghan; Chief Engineer, Vehicle Dynamics, Mark Ellis; and the tech team’s newest member, Pierre Wache. See, we were right the first time about the walking out thing. 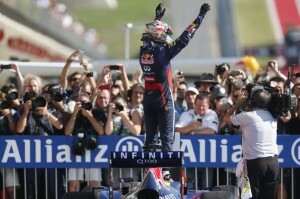 “Hungry Heidi,” as Vettel dubbed the Red Bull RB9 car, proved the most successful car in Infiniti Red Bull Racing’s history with 13 wins, 596 points, and an overall first place finish in the WCC standings. In addition to first place finishes for Vettel at Grand Prix races in Malaysia, Canada, Germany, Korea, and the United States among others, the RB9 enjoyed 11 additional podium finishes, 11 pole positions, and 12 fastest laps between Vettel and Infiniti Red Bull Racing driver, Marc Webber. With the 2014 Formula 1 championship season just a few short months away, it’s fair to say we can assume for a repeat (or, perhaps, five-peat) performance from Sebastian Vettel and the RB9. Brought to you by Infiniti of Cincinnati. Infiniti of Cincinnati carries a wide selection of new Infiniti cars in Cincinnati, including the G35, G37, QX56, and many others. The five-star Infiniti dealer also has a large inventory of used cars, as well as knowledgeable service, parts, and finance departments ready to provide customers with the best maintenance and service options in the Cincinnati area. Visit us online at infinitiofcincinnati.com today.